Pasionated about Genetics and Genomics, I have been working in such a field in different organism from yeast to humans, stopping by plants for a brief time. So you should expect my preLights on gene regulation regardless of the model system. 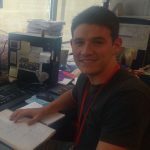 I started my research training at the Andalusian Center for Developmental Biology (CABD) in 2012 studying morphogenesis in fission yeast at the Daga’s Lab until 2014 when I Obtained a BSc in Biotechnology at Pablo de Olavide University (Seville, Spain). In Fall 2013 I had the opportunity to collaborate with the lab of Dr. Mary A. O’connell at NMSU to learn about molecular genetics of plants, working with cultivars of chile pepper. Then I moved to Madrid where I got a MSc in Molecular Biomedicine from Autonomous University of Madrid and I joined the Lab of Miguel Manzanares where I am currently doing my PhD thanks to a ‘laCaixa’ fellowship working on how human variation is linked to gene regulation in physiology and disease. It is thought that networking and collaboration improve every scientific project and carreer so, since as scientist I had to prove it, I recently spent 6 enjoyable months at UCSF in Nadav Ahituv’s lab learning about high-throughput genomic tools. I love sports and talking (too much). I believe science dissemination, especially to the youngest, is immensely important which is why I join any teaching or divulgation programme every time I have the chance. Joris van Arensbergen, Ludo Pagie, Vincent FitzPatrick, et al.